Explanation: Apollo class asteroid 2006 VV2 flashed past planet Earth in late March, approaching to within 3.4 million kilometers or about 8.8 times the Earth-Moon distance. Due to the proximity of its orbit to Earth and its estimated diameter of over 1 kilometer, 2006 VV2 is classified as a Potentially Hazardous Asteroid. Telescopes large and small were trained on the much anticipated flyby, the closest for a known asteroid of comparable size until the year 2036. This composite telescopic view is from a series of images recorded over a period of about an hour on Mar. 28 from Vado, New Mexico. The asteroid begins near the center of the field and tracks down and to the left, apparently passing very near galaxy M81. 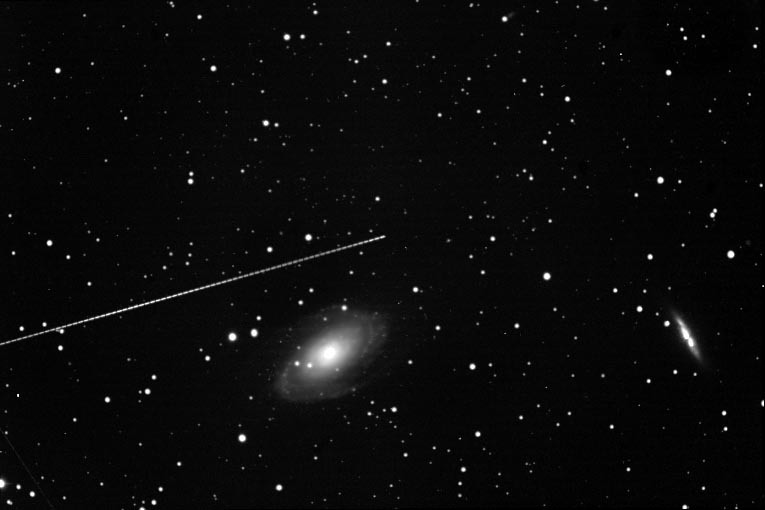 Of course, along with its companion galaxy M82 on the right, M81 is really 12 million light years away, compared to the asteroid's range of a mere 15 light seconds.